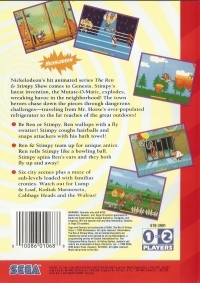 Box Text: Nickelodeon's hit animated series The Ren & Stimpy Show comes to Genesis. Stimpy's latest invention, the Mutate-O-Matic, explodes, wreaking havoc in the neighborhood! The town heroes chase down the pieces through dangerous challenges--traveling from Mr. Horse's over-populated refrigerator to the far reaches of the great outdoors! -Be Ren or Stimpy. Ren wallops with a fly swatter! Stimpy coughs hairballs and snaps attackers with his bath towel! -Ren & Stimpy team up for unique antics. Ren rolls Stimpy like a bowling ball. Stimpy spins Ren's ears and they both fly up and away! -Six city scenes plus a maze of sub-levels loaded with familiar cronies. Watch out for Lump & Loaf, Kodiak Marmosets, Cabbage Heads and the Walrus! 07-01-2014 foxhack Box Text Nickelodeon's hit animated series The Ren & Stimpy Show comes to Genesis. Stimpy's latest invention, the Mutate-O-Matic, explodes, wreaking havoc in the neighborhood! The town heroes chase down the pieces through dangerous challenges--traveling from Mr. Horse's over-populated refrigerator to the far reaches of the great outdoors! -Be Ren or Stimpy. Ren wallops with a fly swatter! Stimpy coughs hairballs and snaps attackers with his bath towel! -Ren & Stimpy team up for unique antics. Ren rolls Stimpy like a bowling ball. Stimpy spins Ren's ears and they both fly up and away! -Six city scenes plus a maze of sub-levels loaded with familiar cronies. Watch out for Lump & Loaf, Kodiak Marmosets, Cabbage Heads and the Walrus! 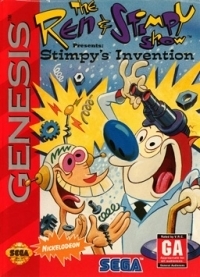 10-29-2012 moonlightvalkyrie Box Text Nickelodeon's hit animated series The Ren & Stimpy Show comes to Genesis. Stimpy's latest invention, the Mutate-O-Matic, explodes, wreaking havoc in the neighborhood! The town heroes chase down the pieces through dangerous challenges--traveling from Mr. Horse's over-populated refrigerator to the far reaches of the great outdoors! -Be Ren or Stimpy. Ren wallops with a fly swatter! Stimpy coughs hairballs and snaps attackers with his bath towel! -Ren & Stimpy team up for unique antics. Ren rolls Stimpy like a bowling ball. Stimpy spins Ren's ears and they both fly up and away! -Six city scenes plus a maze of sub-levels loaded with familiar cronies. Watch out for Lump & Loaf, Kodiak Marmosets, Cabbage Heads and the Walrus! This is a list of VGCollect users who have Ren & Stimpy Show, The: Stimpy's Invention in their Collection. This is a list of VGCollect users who have Ren & Stimpy Show, The: Stimpy's Invention in their Sell List. This is a list of VGCollect users who have Ren & Stimpy Show, The: Stimpy's Invention in their Wish List.